My skin has gone through a lot recently especially with the change of weather and season. I'm always on the quest to for baby soft skin and I've found a handful of products that help me achieve this. Just on a side note, I don't like to use more than one acid product a day and if something is particularly strong then I like to skip a day or two to let me skin recover. 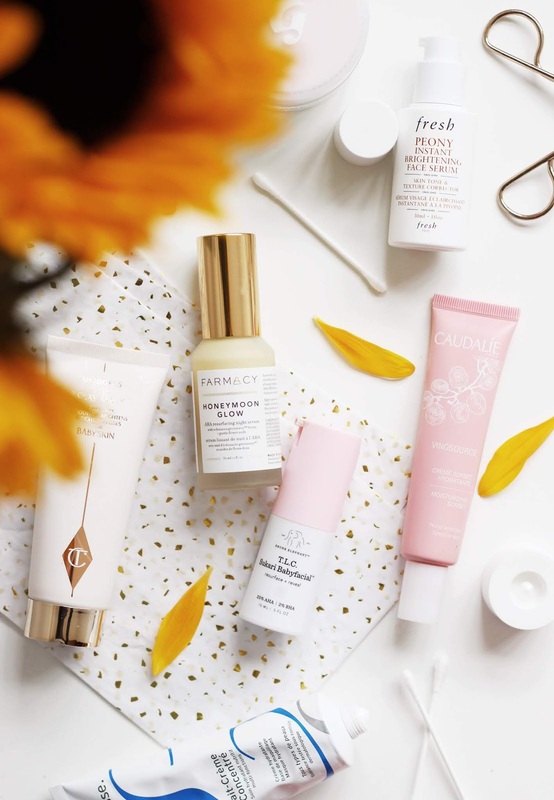 Two masks that always leave my complexion feeling a lot cleaner, brighter and softer are the Drunk Elephant Babyfacial and Charlotte Tilbury Goddess Clay Mask*. The latter is great at detoxifying the skin, whilst the DE offering is amazing at giving the skin an at-home facial. They both rid the skin of dry patches and if applied at night during a pamper routine, the next morning my skin looks even better. I've spoken about the Farmacy Honeymoon Glow* is a previous post, but it's not classed as a mask more on the side of a serum. It has a similar effect to the masks I spoke about above, but it works overnight instead which means you don't have to think about when to wash it off. It only takes one application to make my complexion look more radiant and it ensures that my foundation goes on smoothly. In terms of moisturiser the Embryolisse Lait-Crème Concentré* is great at giving a healthy dose of hydration in one go, however it is a lot thicker than my favourite moisturiser of the Summer which was the Caudalie Vinosource Sorbet* which I'm currently finishing up at the moment. They're both great at making my skin look more nourished and feeling softer. If I feel like I need any extra layer especially if I've been using acids, I go in with the Fresh Peony Serum* before any moisturisers to make that my skin is prepped and looking great. What are your favourite products for baby soft skin?